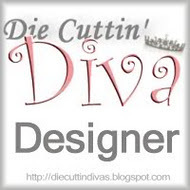 Pat's Scraps: Die Cuttin' Divas Challenge--Love Your Pet! It's time for a new DCD Challenge! This week the challenge is to create a project using an image of your favorite pet. Didn't the Design Team create such great projects!?! Well, this was an easy one for me. We have four cats that we adore, so I knew I wanted to use a cat image. I have the Cricut Lite Meow cartridge and found the cutest image on it to use, along with the perfect sentiment. Here's my card. ﻿The paper is Deja Views, Cat's Life, although these particular two patterns didn't have any reference to cats. The paper I used for the cat was a 4x6 scrap I received as part of a giveaway that I won a while back, and I loved the textured look of it. Added a strip of ribbon across the middle, some faux stitching around the border, a PK critters face on the kitty, and on the inside, punched two paw prints in the border paper, and printed the sentiment on my computer. What do you think? Super cute card! I am not a cat person but my brother is! Love the paper! Adorable!! Did you mention how you made that purr-fect sentiment on the front? I read your post twice and didn't see it, but I also don't have my glasses on, so you know.... LOL I love this card. Great job!! Now, how did you do that sentiment on the front. :) My email is craftyjanis@live.com if you want to email me your secret. Thanks so much for playing with us at Paper Playtime. Good gracious, I've missed a lot of your posts. I didn't leave comments on any of the past ones but I did catch up! There were several that I really, really liked. You've been a very busy and crafty lady. Thanks for stopping by and following my blog! I am, returning the favor. You have some great projects here! How adorable. I am not a kitty person since I am allergic to them, but they sure are cute when they are playing. Love the sentiment you added. Thanks for being a great DT member! How cute!! I just made a card with the same cut! (I'm going to link it up!) I love my cats too- I have 3. The kitty & birdy are too cute & such a great sentiment stamp. Love the papers & stitching also! So cute, wonderful job with the faux stitching and that cats face is adorable, thanks for joining CCC! Super cute. Love that peachy face.